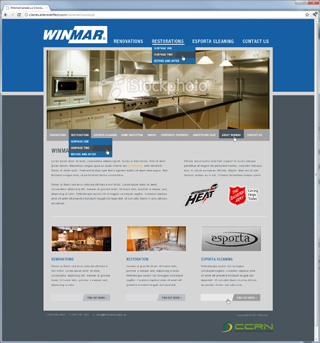 Just the other day I pushed the Winmar Fraser Valley website live! If you are unfamiliar with the Winmar, they offers restoration, and renovation services, as well as very neat soft-contents cleaning. Man, I don't really know what else to say about that. This is going to be a super short post! I guess I will talk about producing the design concept for them? Feel free to skip it though (I would if I weren't typing it). I started by discussing with them what they wanted of their website, aesthetically and functionally. It turns out they were looking for a design to convey cleanliness, professionalism, and a sense of refinement. Coincidentally, those can match up perfectly with clarity and usability (and I am such a fan those two). By limiting the number of pages, I hoped to decrease the chances of users getting lost and frustrated, and increase the likelihood of them quickly and easily finding the information that they were looking for. 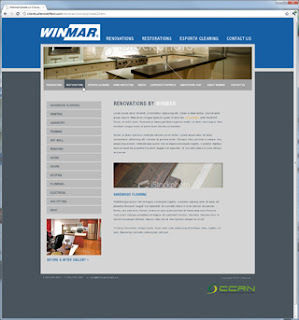 It was meant to promote a site that provided clients with the information they wanted before calling (or emailing) for more: what Winmar offers, why it benefits them, and how to get into further contact. With more usage data, further adjustments to the page structure could be made. Good news: they liked the design! Of course, there were a few changes requested here and there (so it doesn't look quite like the concept I produced), but now the website is live.